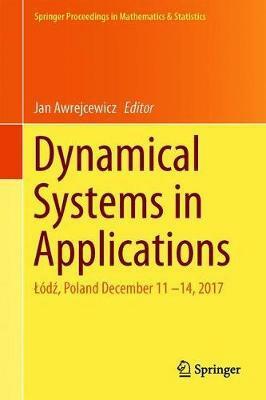 The book is intended for all those who are interested in application problems related to dynamical systems. It provides an overview of recent findings on dynamical systems in the broadest sense. Divided into 46 contributed chapters, it addresses a diverse range of problems. The issues discussed include: Finite Element Analysis of optomechatronic choppers with rotational shafts; computational based constrained dynamics generation for a model of a crane with compliant support; model of a kinetic energy recuperation system for city buses; energy accumulation in mechanical resonance; hysteretic properties of shell dampers; modeling a water hammer with quasi-steady and unsteady friction in viscoelastic conduits; application of time-frequency methods for the assessment of gas metal arc welding conditions; non-linear modeling of the human body's dynamic load; experimental evaluation of mathematical and artificial neural network modeling for energy storage systems; interaction of bridge cables and wake in vortex-induced vibrations; and the Sommerfeld effect in a single DOF spring-mass-damper system with non-ideal excitation. Illustrations note 200 Tables, color; 221 Illustrations, color; 99 Illustrations, black and white; XV, 506 p. 320 illus., 221 illus. in color. The book is intended for all those who are interested in application problems related to dynamical systems. It provides an overview of recent findings on dynamical systems in the broadest sense. Divided into 46 contributed chapters, it addresses a diverse range of problems. The issues discussed include: Finite Element Analysis of optomechatronic choppers with rotational shafts; computational based constrained dynamics generation for a model of a crane with compliant support; model of a kinetic energy recuperation system for city buses; energy accumulation in mechanical resonance; hysteretic properties of shell dampers; modeling a water hammer with quasi-steady and unsteady friction in viscoelastic conduits; application of time-frequency methods for the assessment of gas metal arc welding conditions; non-linear modeling of the human body's dynamic load; experimental evaluation of mathematical and artificial neural network modeling for energy storage systems; interaction of bridge cables and wake in vortex-induced vibrations; and the Sommerfeld effect in a single DOF spring-mass-damper system with non-ideal excitation. Behn, C. and Kraml, J: Gait Transitions in Artificial Non-standard Snake-like Locomotion Systems Using Adaptive Control.- Brenkacz, L., Zywica, G., Drosinska-Komor, M. and Szewczuk-Krypa, N: The Experimental Determination of Bearings Dynamic Coefficients in a Wide Range of Rotational Speeds, Taking into Account the Resonance and Hydrodynamic Instability.- Burdzik, R: Analysis of Rail Vibration Signal Time and Frequency Structures Generated by Different Mechanisms.- Chmielewski, A., Guminski, R., Mydlowski, T., Malecki, A. and Bogdzinski, K: Model Based Research on ICE Engine Powered by Alternative Fuels.- Chmielewski, A., Mozaryn, J., Guminski, R., Bogdzinski, K. and Szulim, P: Experimental Evaluation of Mathematical and Artificial Neural Network Modeling of Energy Storage System.- Csukas, E.-S. and Duma, V.-F: Finite Element Analysis of a Configuration of Optomechatronic Choppers with Rotational Shafts.- Danek, W. and Pawlak, M: Charpy Impact Testing Machine in Modeling of Vehicle Frontal Crash with Street Lights.- Dutkiewicz, M: Interaction of Bridge Cables and Wake Behind in the Vortex Induced Vibrations.- Dyk, S., Byrtus, M. and Smolik, L: Steady-state Behaviour of the Jeffcott Rotor Comparing Various Analytical Approaches to the Solution of the Reynolds Equation for Plain Journal Bearing.- Falborski, T., Soltysik, B. and Jankowski, R: Numerical Investigation on Dynamic Performance of a Multi-storey Steel Structure Model and Comparison with Experimental Results.- Fiebig, W: Accumulation of the Energy in Mechanical Resonance.- Gorka, J. and Jamrozik, W: Application of Time-frequency Methods for Assessment of Gas Metal Arc Welding Condition.- Grzelczyk, D., Biesiacki, P., Mrozowski, J. and Awrejcewicz, A: A 3-link Model of a Human for Simulating a Fall in Forward Direction.- Grzelczyk, D. and Awrejcewicz, J: Reflectance and Transmittance of Cholesteric Liquid Crystal Sandwiched Between Polarizers.- Herisanu, N. and Marinca, V: Analysis of Nonlinear Dynamic Behavior of a Rotating Electrical Machine Rotor-Bearing System Using Optimal Auxiliary Functions Method.- Jarzebowska, E., Augustynek, K. and Urbas, A: Development of a Computational Based Reference Dynamics Model of a Flexible Link Manipulator.- Jasionowski, R. and Kostrzewa, W: Optimization of Geometry of Cavitational Tunnel Using CFD Method.- Kik, T., Moravec, J. and Novakova, I: Application of Numerical Simulations on 10GN2MFA Steel Multilayer Welding.- Komorski, P., Nowakowski, T., Szymanski, G. M. and Tomaszewski, F: Application of Time-frequency Analysis of Acoustic Signal to Detecting Flat Places on the Rolling Surface of a Tram Wheel.- Kosiara, A., Cholodowski, J. and Skurjat, A: Development of a Prototype Dynamic Weighing System for Single Bucket Excavator.- Kralikova, R., Badida, M., Sobotova, L. and Badidova, A: Design of Illumination and Lighting Visualization by Simulation Methods.- Maciag, P., Malczyk, P. and Fraczek, J: Optimal Design of Multibody Systems Using the Adjoint Method.- Miroslaw, T. and Zawadzki, A: Non-linear Modelling of Human Body Dynamic.- Mitoraj, R. and Szczotka, M: Dynamics of a Portable Module Handling System.- Palechor, E. U. L., Machado, M. R., de Morais, M. V. G. and Bezerra, L. M: Dynamic Analysis of a Beam with Additional Auxiliary Mass Spatial via Spectral Element Method.- Palczynski, T: Influence of Air Temperature on Dynamic Properties of Pipes Supplied with Pulsating Flow.- Palczynski, T. and Lagodzinski, J: Model of Kinetic Energy Recuperation System for City Buses.- Sakow, M., Marchelek, K., Parus, A., Pajor, M. and Miadlicki, K: Signal Prediction in Bilateral Teleoperation with Force-Feedback.- Shahlaei-Far, S. and Balthazar, J. M: Method of Direct Separation of Motions Applied to a Non-Ideal Electromechanical Pendulum System.- Shatskyi, I. and Perepichka, V: Problem of Dynamics of an Elastic Rod with Decreasing Function of Elastic-Plastic External Resistance.- Shatskyi, I., Popadyuk, I. and Velychkovych, A: Hysteretic Properties of Shell Dampers.- Svoboda, M., Schmid, V., Soukup, J. and Sapieta, M: Modal Analysis of the Vehicle Model.- Skurjat, A. and Kosiara, A: Directional Stability Control of Body Steer Wheeled Articulated Vehicles.- Zdziebko, P., Martowicz, A. and Uhl, T: Influence of the Mechanical Properties of Pantograph Structural Parts on Its Interaction with a Catenary.- Urbanowicz, K. and Firkowski, M: Modelling Water Hammer with Quasi-steady and Unsteady Friction in Viscoelastic Pipelines.- Warczek, J., Burdzik, R. and Konieczny, L: The Concept of Autonomous Damper in Vehicle Suspension.- Watroba, P., Pawlak, M. and Gasiorek, D: Validation of the Numerical Model of Impuls I Electric Multiple Unit Driver's Cab.- Wojnicz, W., Zagrodny, B., Ludwicki, M., Syczewska, M., Mrozowski, J. and Awrejcewicz, J: Approach for Determination of Functioning of Lower Limb Muscles.- Wos, P. and Dindorf, R: Modeling and Control of Motion Systems for an Electro-hydraulic Tripod Manipulator.- Zarodnyuk, A. and Cherkasov, O: Support Reaction in the Brachistochrone Problem in a Resistant Medium.- Szlachetka, O., Jaworski, J. and Chalecki, M: Free Vibration of Cantilever Bars Having a Shape of Solid and Hollow Curvilinear Truncated Cone.- Zelei, A., Molnar, C. A. and Insperger, T: Four-bar Mechanism Substitution for Balance Board Experiments: A Parametric Study.- Zemanova, A., Plachy, T., Schmidt, J., Janda, T., Zeman, J. and Sejnoha, M: Numerical and Experimental Modal Analysis of Laminated Glass Beams.- Zardecki, D. and Debowski, A: Methods of Simulation Investigations of Non-linear Vibrations in the Steering System of a Motorcycle.